Metalsistem Australia specialises in assisting industry in transforming the way they think about their storage needs. With current changes in business accessing stock quickly and delivering it quickly is an important factor in customer satisfaction. Stock stored inefficiently can often lead to decreased productivity and increased costs. Storage therefore is crucial to a way a business performs. 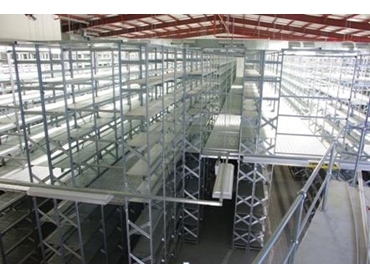 Super 123 is suitable for high rise shelving that can later be converted to a multi-tiered structure with suspended walkways and staircases thus giving a different pick module which eliminates machinery retrieval of stock and different SKU storage.